An internship training programme by Macau casino operator Galaxy Entertainment Group Ltd (GEG) is marking its 10th year. The firm said that in the past decade, the scheme had created opportunities in hospitality and the gaming sector for 560 tertiary-education students and 50 secondary-school students with special needs. In a press release issued by Galaxy Entertainment on Monday, the company said the annual programme had just ended its first term for this year, providing the class of 2018 with training and job opportunities in the fields of business administration, hospitality, marketing and gaming. Galaxy Entertainment added it would hire some of this year’s special-education interns after they graduate. The first term began in January and trained 66 students from the University of Macau, the Macau University of Science and Technology, the City University of Macau, the Macao Polytechnic Institute, the Institute for Tourism Studies, the Escola Luso-Chinesa Técnico-Profissional and elsewhere – but not all at the same time. The second term of the programme began last month. The programme let them put into practice skills and knowledge learned in college and broadened their understanding of the day-to-day operations of casino-resorts. The interns took turns to do jobs in the public relations, human resources and administration, housekeeping and environmental services, food and beverage, and hotel operations departments. The GEG Integrated Resort Internship Programme Appreciation Gathering 2018 was held at Banyan Tree Macau last week, with executives, department representatives and guests from Macau’s educational institutes in attendance to recognise the efforts of the interns. This year’s scheme was for the first time organised jointly by Galaxy Entertainment and Macau’s Labour Affairs Bureau. 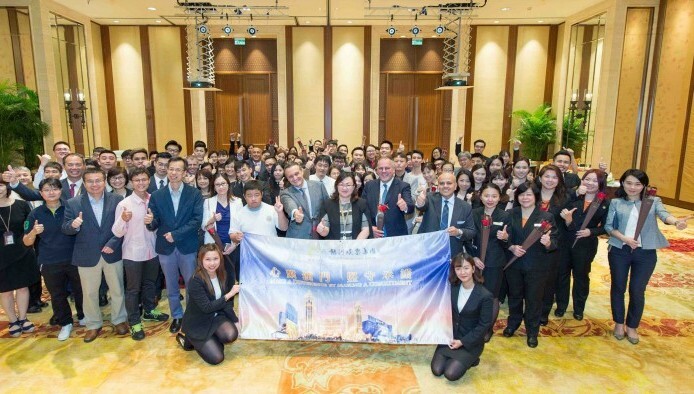 After 10 years of supporting Macau’s hospitality sector, Galaxy Entertainment said it would continue to offer students wide-ranging internships with a view to nurturing their talents.